Join Lewes Lettering Co. to learning the basics of Modern Calligraphy! These workshops last about 2.5 - 3 hours and include instruction on how to use traditional calligraphy supplies (nibs & ink). Using these tools you will create the distinct thick and thin lines that form modern calligraphy! You will leave with all supplies and and lots of information to continue the learning at home! You in? Check out when & where we will be hosting our next workshop below! a small take home project to show your friends! 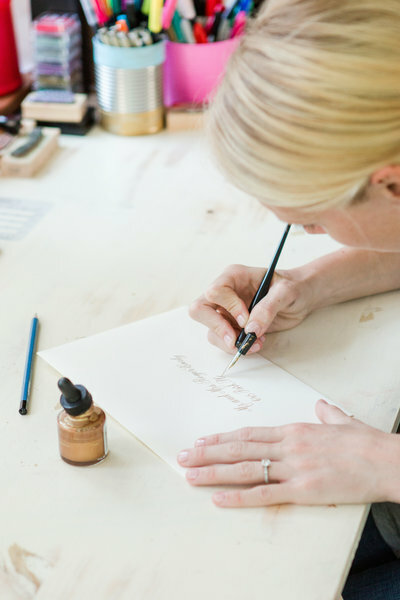 Join Lewes Lettering Co. to learn how to create Faux-calligraphy! All the beauty without the complex supplies, faux-calligraphy is the perfect method to use when working on non-paper surfaces like chalkboards, wood and canvas! Faux-Calligraphy is done with pens, not a nib and ink but gives similar results! 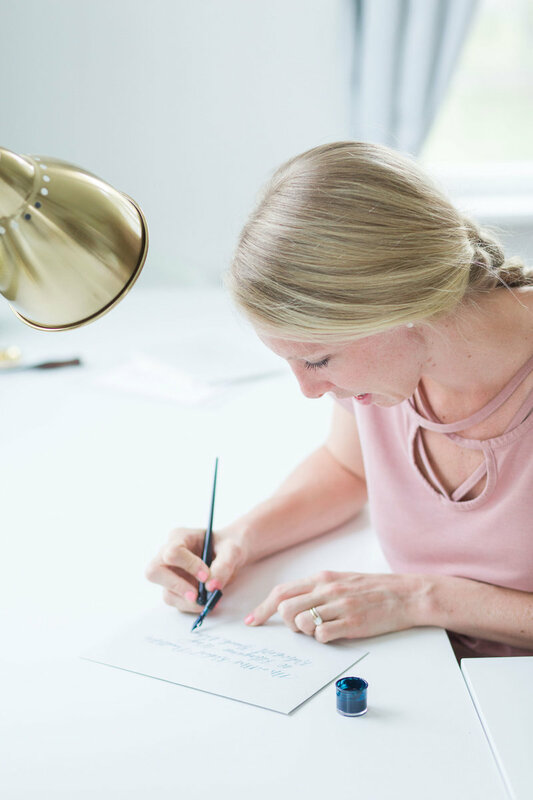 You will leave with a few of our favorite pens to continue practicing faux-calligraphy at home and a guide to the best pens out there for other surfaces. 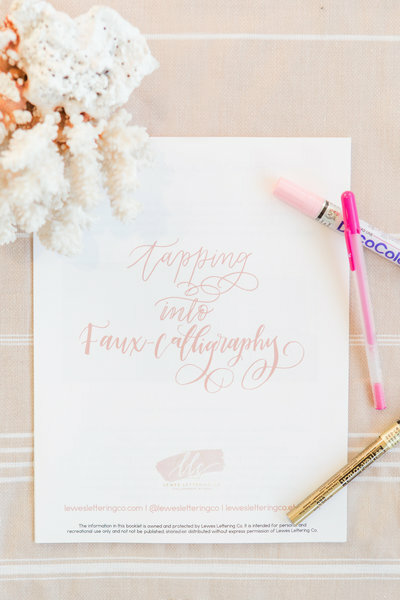 The class will start on paper, but finish by completing a faux-calligraphy project to take home & show off! an alphabet and number exemplar | your own, personalized project to take home! You have successfully joined our list. We'll keep you updated for upcoming workshops! 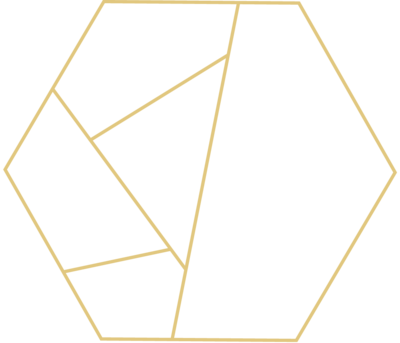 JOIN OUR EMAIL LIST TO be updated about future workshops! INTERESTED IN A PRIVATE WORKSHOP FOR YOU AND YOUR GAL PALS? We'll bring the supplies, you bring the wine! 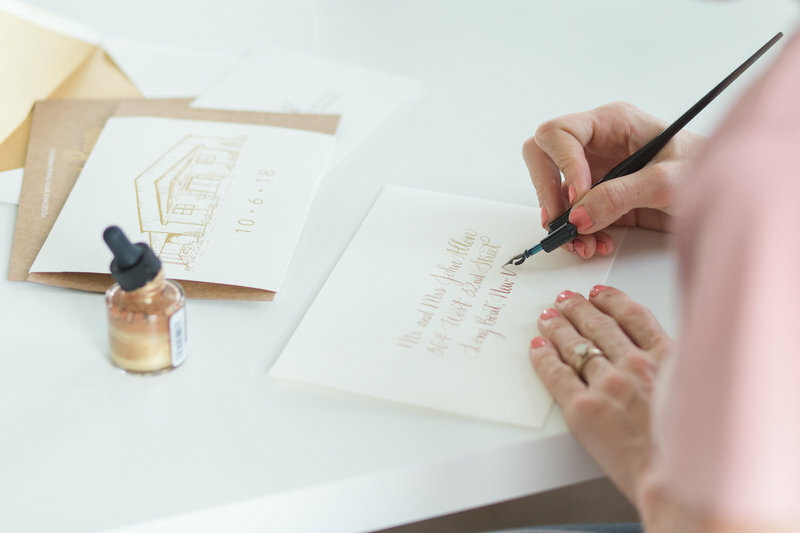 Lewes Lettering Co. is now offering private in-home workshops for groups of 6 or more! Perfect for a Mom's night out, Bridal Shower or Corporate Event! Workshops last 2-3 hours depending on the size of group. All supplies are provided. Inquire below for more information on hosting a private workshop! Give a gift they'll be excited to use! making it a great gift for all the crafters and future brides in your life! I took one of Katy's calligraphy classes. She is a wonderful instructor. She's very organized and patient (especially for us beginners). I would highly recommend taking a class if you're interested in learning calligraphy. Katy did an excellent job leading the faux-calligraphy workshop! She was so personable and welcoming. She took a complicated art form and made it palatable to us 'normal folk'. It was a lovely evening and I am excited to keep practicing what she taught us! I attended one of the Lewes Letterings Co. Faux-Calligraphy workshops and had so much fun! Katy is awesome and very helpful. All supplies were provided, as well as refreshments. I learned so much and can't wait to start making some signage using the tips I gained from this event. 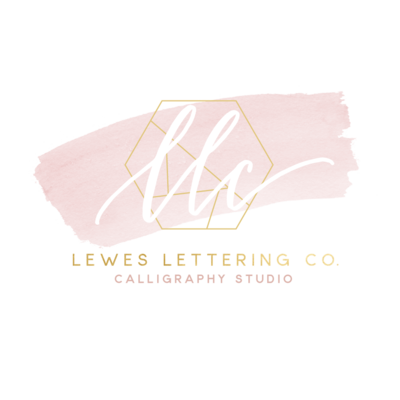 I would highly recommend Lewes Lettering Co. and their workshops!! Attended Lewes lettering event last night. Katy is an excellent host and instructor. Her love of calligraphy is evident in her approach to sharing her knowledge and tips for those of us who are novices. Thank you for an excellent night and great venue. Liquid was great and accommodating. Hope you have many more classes so I can learn the beauty of handwriting with a flair from the past. I am so impressed with Lewes Lettering Co. I reached out to Katy to write a quote for me that was near and dear to my heart. What arrived in the mail, (a short two weeks later!) absolutely blew my expectations away. Katy took my words and brought them to life in the most beautiful way. Her work now hangs above my bed and truly makes me smile every single night. I highly recommend Lewes Lettering Co.! Professional, affordable, and most importantly - personal. Thanks again! It was such a pleasure to meet Katy. The class was awesome and I really enjoyed being there and learning such a fun craft. Thanks so much for the opportunity. 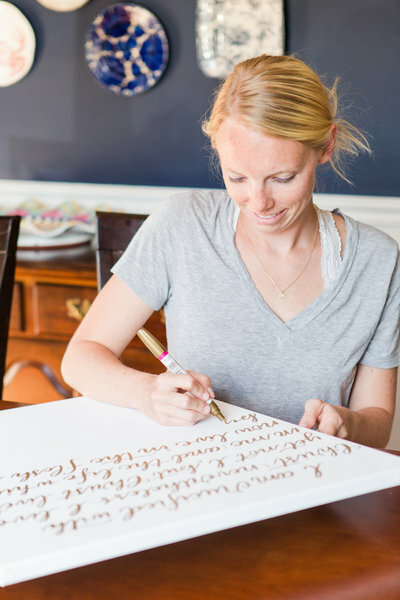 If you are considering learning faux-calligraphy and doing an awesome project, don't miss out. Katy has so much talent and made the class so much fun. What an enjoyable night! Thanks Katy!